Normal R-wave progression implies that the R-wave amplitude increases gradually from V1 to V5 and then diminishes again in V6. Refer to Figure 1. Abnormal R-wave progression implies that the gradual increase from V1 to V5 is absent. It may be broken, as in Figure 1. Any type of infarction may cause pathological R-wave progression. However, the specificity for pathological R-wave progression is considerably lower than pathological Q-waves and guidelines do not state any ECG criteria specific to R-wave progression. Figure 1. Pathological R-wave progression is indicative of previous myocardial infarction. New U-waves (in absence of bradycardia) may indicate ischemia. If U-waves were present on previous recording, the amplitude must be increased in order to suggest ischemia. Inverted U-waves are even more typical of ischemia (but the sensitivity is low). U-wave changes always accompany other ischemic ST-T changes. They may occur in both NSTEMI and STEMI. The QT (QTc) interval may be prolonged, shortened or unchanged in ischemia. Acute transmural ischemia may transiently increase the amplitude of the R-waves. This is believed to be due to delayed (and thus electrically unopposed) depolarization in the ischemic area. 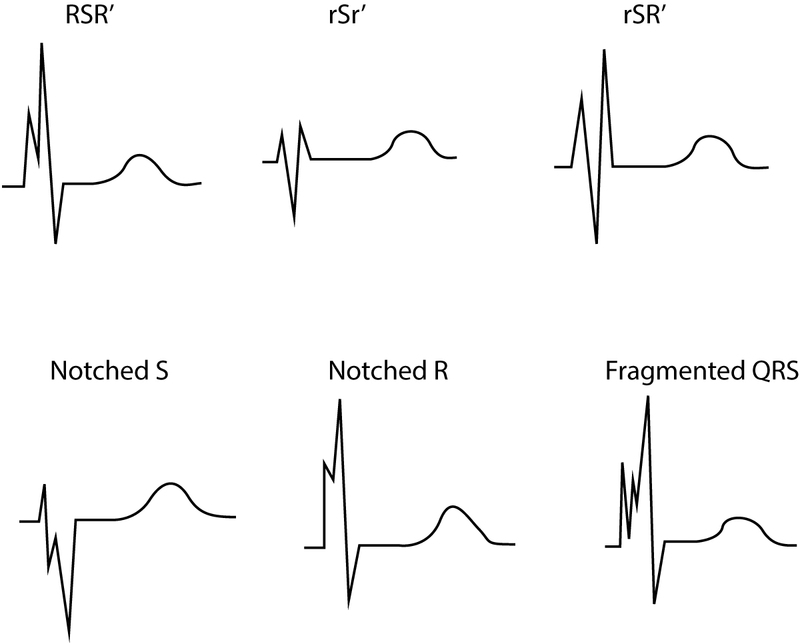 In case of complete/incomplete bundle branch block or pacemaker rhythm, >2 notches are required in the S-wave or R-wave. Fragmented QRS complexes are indications of previous myocardial infarction. There are imaging studies demonstrating that QRS fragmentation is more common than development of pathological Q-waves after infarction. The sensitivity of fragmented QRS for myocardial infarction was 86%, as compared with 36% for pathological Q-waves. However, the specificity was lower for fragmented QRS (89% vs 99%). Absence of fragmented QRS has a high negative predictive value (93%) for myocardial infarction. Moreover, fragmented QRS is associated with increased risk of sudden cardiac death and ventricular arrhythmias. Figure 2. Fragmented QRS complex. These QRS configurations are also indicate of previous myocardial infarction. Mycardial infarction/ischemia may be complicated with cunduction defects (discussed in separate article).